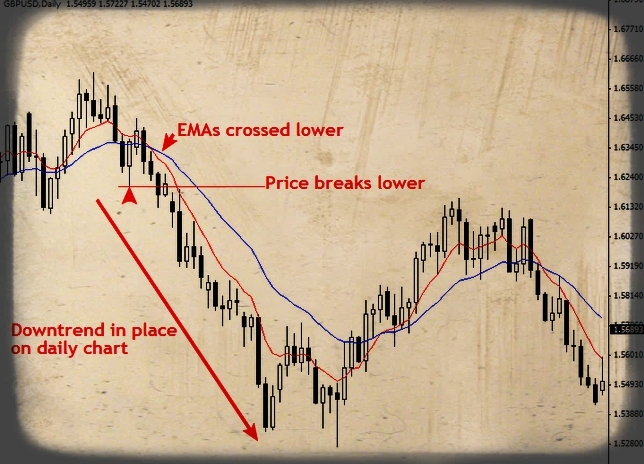 The best way for beginner’s to learn how to trade the 4 hour chart, or any lower time frame, is to look at the next time frame above it, and trade it along with that time frame. We are basically looking for two things on the daily chart: The trend (if there is one) and the key levels. After identifying the daily chart trend and drawing in the key daily chart support / resistance levels. We will check out the 4hr chart and look for any obvious price action setups. We are looking for an obvious price action setup that is signaling a potential move in the direction of the daily chart trend and(or) that has formed from a key daily chart support or resistance level. Note that when taking a 4 hour setup in the context of a daily chart trend like this, you can typically get a very very good risk to reward ratio. You have the higher time frame daily chart trend on your side, and then you get the advantage of employing a tighter stop loss by looking for a signal on the 4 hour chart. Once you get this process down you can find some very lucrative trade setups. However, don’t think that this will continue as you move down in time frame, because once you get below the 1 hour the charts get very hard to trade and have many false-signals, so the tighter stop potential is more than offset by the false-signals generated by the market noise of time frames under the 1 hour. This inter-play between the 4 hour and daily is something I highly recommend all of you try to get down. 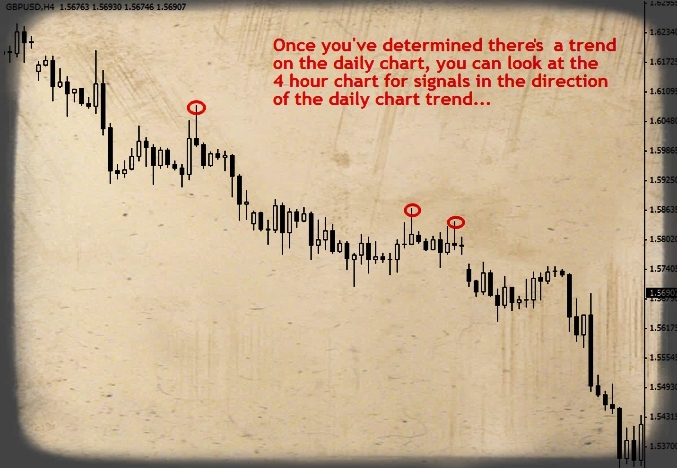 Use the daily chart as your guide, and when you see a strong trend setting up on it, drill down to the 4hr and look for obvious and well-defined PA setups in the direction of the daily chart trend.